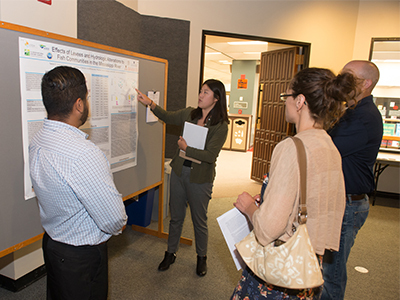 The culmination of interdisciplinary research conducted by undergraduates from across the United States, many of whom are first generation students, was on display during the Southern Illinois University Edwardsville Research Experiences for Undergraduates (REU) Symposium held Thursday, July 27 on campus. Ten students shared their findings after spending eight weeks engaging in field archaeology at SIUE and fish-monitoring programs in the Mississippi and Illinois Rivers, and learning methodologies and theoretical perspectives that bridge archaeological and ecological concepts. They were the first cohort to participate in a three-year program funded by a $287,690 National Science Foundation (NSF) REU grant awarded to SIUE and the University of Illinois (U of I). The program is titled, “Exploring Evidence of the Anthropocene: Archaeological and Ecological Interdisciplinary Research Experiences for First Generation Students in the Upper Mississippi River System.” The Anthropocene is a proposed geological epoch in which scholars suggest current climate and environmental conditions are mostly influenced by human activity rather than natural processes. “I have always loved history, and archaeology gives us a good background to consider people and society today,” said Colby Williams, a rising junior at the University of South Florida. “I also like environmental conservation, so learning about it and getting to conduct the hands-on research drew me to this project. “I thought this was the perfect interdisciplinary combination, because it’s important to know the past to help us move forward in the present and future,” added Taesoo Jung, a rising senior at the University of Georgia. The program is led by principal investigator (PI) Carol Colaninno-Meeks, PhD, assistant research professor in the SIUE STEM Center. Co-PI John Chick, PhD, director of the Great Rivers Field Station, U of I Natural History Survey, closely operated the program. “Watching these undergraduates learn how to conduct interdisciplinary research in the field and laboratory has been an incredibly rewarding experience as an educator,” Colaninno-Meeks said. “They have put in long hours and dedicated much of their time to learning new skills and ways of thinking. Along with field work and research opportunities, program leaders provided extensive mentorship to the students as they go on to navigate their next educational and career moves. “We will be operating this program for the next two years at SIUE,” Colaninno-Meeks said. “We look forward to welcoming our 2018 cohort that will build on the exceptional work that’s been completed this summer. The students will present an original contribution to the field of studies documenting the timing and scope of the onset of the Anthropocene in the Upper Mississippi River System at the Mississippi River Research Consortium being held spring 2018. 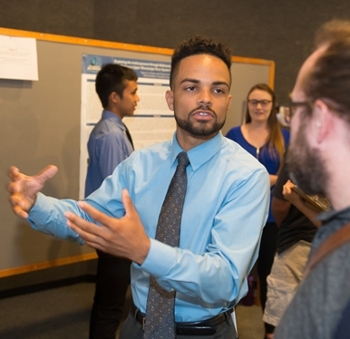 Photo: Colby Williams, a rising junior at the University of South Florida, explains his research project during the REU Symposium at SIUE. Taesoo Jung, a rising senior at the University of Georgia, and her research partner present their findings during the REU Symposium. 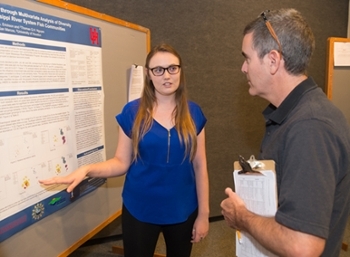 Taylor Erickson, a rising sophomore at California State University San Marcos, describes the findings of her team’s research project.